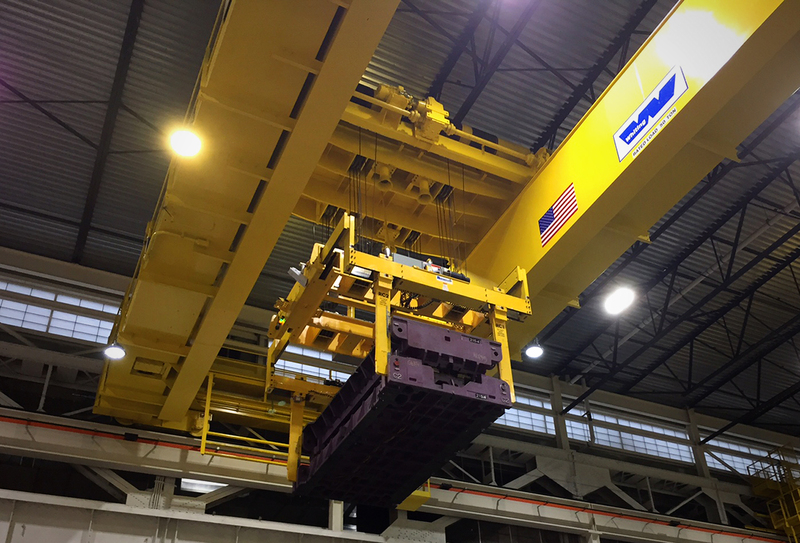 Throughout the Americas, Whiting cranes are found in many automotive stamping and assembly plants. Because Whiting cranes are uses in every part of the production process, each application requires custom planning, engineering, installation and maintenance solutions that are responsive to the specific needs of the automotive industry. One of our recent lifting innovations has shown how Whiting can help make material handling more efficient. Our Automated Die Gripper Cranes have a positional tolerance of +/- 5 mm, and have sped up the process of moving dies while reducing manpower needs for stamping operations. A Die Handling Crane in a stamping bay can handle die storage as well as die loading and unloading at the presses. Reliability of the crane is vital to maximizing production rates. Coil Handling cranes may use a variety of below-the-hook devices from simple C-hook attachments to coil lifters with telescoping legs. Many Scrap Handling operations require a 20 ton lift capacity, however Whiting can design solutions for cranes between 10 and 60 tons.